ALPSP blog: at the heart of scholarly publishing: The Plymouth textbook project... paradise lost? What are the challenges in providing 80% of your undergraduate student intake a full set of core e-texts? 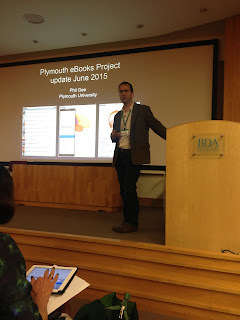 Phil Gee, Associate Professor in Psychology at Plymouth University outlined how they tackled this challenge in 2014 with the Plymouth eBooks Project. Gee observed that it seems strange that often there are many barriers to students accessing ebooks. You should ideally teach knowing ALL students have access to the texts, anywhere they need them. There is a need to level the playing field to ensure universal access. Perhaps one day, there won't be any text books, but online resources. At Plymouth, they have focused on note sharing. Students can subscribe to access the tutor's notes. His course book is covered in criticism and rants about the text, viewpoint or bias. Now, there is potential to build into the book so it is all there. You could potentially include interactive graphs, quizzes etc. His focus has been on first year textbooks. They wanted to free up library resources. What they have tried to achieve with their project is to make sure the university funds the texts from a different budget. This should allow the library to focus on the core function: to cater to journals and specialist books (as well as nice comfortable places to chat). The project started in 2011. They began by giving all first year students a set of 12 textbooks. They were given a code to download personal copies of all texts. It was so successful they decided to extend to second year students as well as six other programmes in the faculty. In 2013, they added a few more programmes. All this was funded from School, not library budgets. In September 2014 they covered 4,062 students rising to c. 7000 including Plymouth Business School (reaching every student on every level of their course). There are 192 modules, 109 Programmes and 25,931 books (from c.600 titles) covered, plus the Business School. It's interesting to note that both Geography and the Business School have pulled back from it, primarily due to cost. They post links to each of the books on the course website. The student clicks on the book link to open the online version to browse or set up an account to download (once authenticated through usual systems). The students download the books in perpetuity. If they don't set up an account they won't be able to access the books after they leave the university. Crucially, the books can be accessed offline e.g. when they are on their mobile and the signal is patchy (quite common in the South West). It has been very successful, but there some issues when you come to scaling. He felt they didn't do as good a job of implementing it as he would like, so was pleased to see a student and staff approval level of over 90%. It's unusual to persuade a lecturer that change is a good thing, so the high staff approval was a real success! Even more encouraging was the 38% who said they were influenced to come to Plymouth when making their course choice. It was a factor that helped with the cost, but also as an innovative approach to finding a way to help students succeed. They have focused in on evidence of ways to improve performance on a course and have found this to be the case. It is good for them, the lecturers, to help them do their job more effectively, but also for the university, who have happy students. Unsurprisingly, there have been challenges. Libraries are learning to negotiate with publishers in this way: negotiating from a point of view of 'this is all the money I have.' They also prefer ePub format as it is a better experience for multi-devices. Gee believes this is good for publishers as income is much more predictable. Students are used to getting content for free, so dealing with institutions is a more reliable deal. Multi-year deals have cost and market advantages. Inertia can set in and universities are less likely to pirate content. They have buy-in at a senior institutional level who are keen to continue. The biggest barrier to this is getting the right price. Gee believes price is a key deciding factor for universities to buy in to this if the price is low enough (talking c.£50 for an entire student list). He feels the sales will come. He also sees this as a way to halt declining student sales - 58% of first years buy a book. The mean number of books = 2.2, median = 1. the mean spend per student = £62.33 retail. However, he feels this is a window of opportunity that is closing. Many institutions have now ended all their incentives such as free iPads. People are less worried about recruitment now the higher fees are established. There is more interest in the university as publisher and in alternatives to textbooks. A lot of publishers are investing in adaptive learning systems, but these won't get beyond the niche. PLEASE put the technology in ePub3! Gee closed by saying they want to develop new partnership and ways of thinking about content and the best way to do this is via collaborative partnerships. But be warned, the moment may be passing. Phil Gee spoke at the Personalised Learning and Publishing Partnerships seminar.